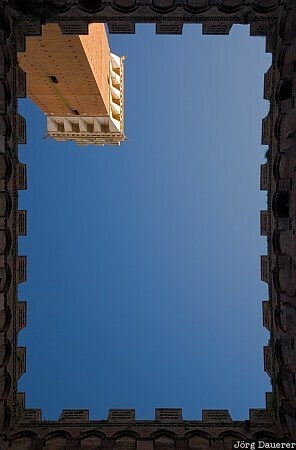 The tower Torre del Mangia seen from a small courtyard inside the town hall of Siena (Palazzo Pubblico). Siena is in the central part of Tuscany, Italy. This photo was taken in the afternoon of a sunny day in October of 2009. This photo was taken with a digital camera.